The star of this still life, the snake in the foreground, was not known to me until last night when I saw it glistening by the side of the road. My first thought was that I was looking at a silver bracelet in the dusk-dark light of Fairmount Park. But once I realized it was a snake — underside up — I had to take a photo of it. I took one picture, then another; then realized a car had stopped beside me, the family inside craning their necks to see what I was shooting with my phone. I said, “Dead snake!”, maybe too excitedly to the shotgun-riding mom and they sped off as if I was about to pass it through the window. Amused, I cranked up the music and began to walk again. Then I stopped and reversed directions: I had to have the snake; I had to take it home before it could be flattened by another passing carload. Spying a discarded extra-large Slurpee cup, clear plastic dome-top intact, I scooped it up. It would be the perfect snake caddy. Approaching, I was relieved to see the snake undisturbed. I picked up a small branch broke it into the shape of a hook; using movements I’d seen snake-handlers employ on TV, I placed it into the cup. I was amazed that it was at least 18-inches long: Cool. Reptilian cargo safely loaded, I finally headed homeward. I caught a couple of shades-wearing teenagers checking out my Slurpee, and I thought, “If I showed you what’s in this cup, you’d scream!” . . . I chuckled out loud; they crossed the street. Home again, I gently slid the snake out onto paper towels. Viscous sugary blue residue from the cup’s bottom was camouflaging its pearlescent underside. I rinsed it under cool water and patted it dry, placing it on another paper towel for presentation to Paul in his office. Looking up, he said it was beautiful, then turned back to his computer. I didn’t take it personally, I could’ve shown him a severed limb and he would’ve done the same. He’s like that when he’s working. I placed both snake and wrap into a Ziploc and put it into the fridge. Soda shelf. It stayed there until this afternoon when the star was needed on the set. 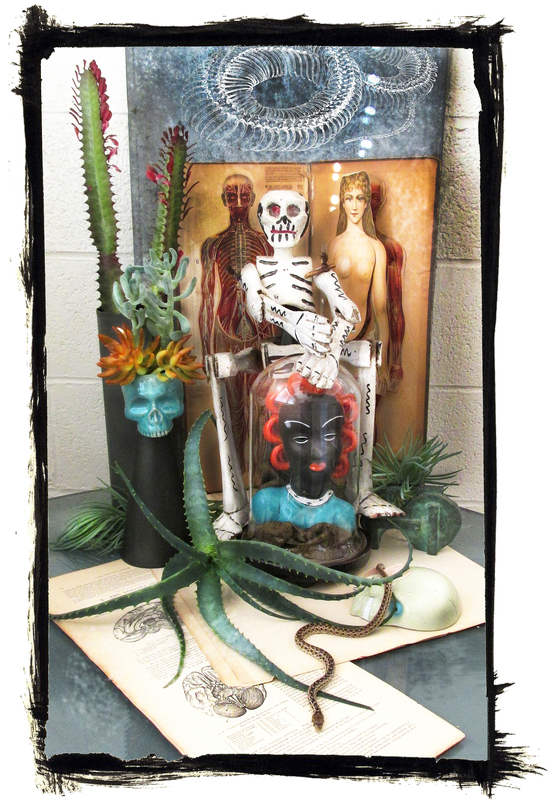 I’d set a suitably festive Halloween scene with mystical elements, sinister succulents and my favorite antique tome: Dr. Minder’s Anatomical Manikin of the Female Body. The snake was a real trooper, enduring quite a few poses before I settled on this final one. I love how it seems as if it could just slither forward and out of the picture with a flick of its tail . . . on to further macabre adventures. The snake is gone now; returned to the natural world. It had a brief life, and even shorter time in the spotlight. But I’m glad we crossed paths so I could share its sinuous beauty. I do love snakes, they are considered a symbol of fertility yeah know? As a professional gardener, I am always happy to find one and always take a moment to admire. Nice Halloween arrangement too! 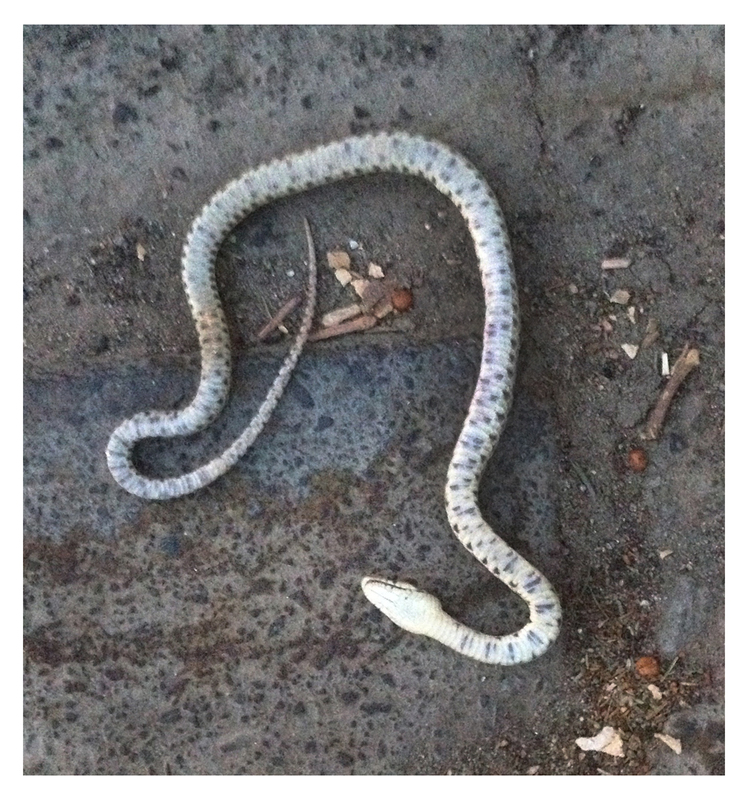 I both love and fear snakes … it took real courage for me to pick this one up — Thanks, Monica! Now that is awesome – the arrangement, the color scheme, everything. I would be happy to have a tenth of your creative vision! remind me to tell you the story of the rattlesnake Annette and I found in Beverly Hills! I was looking at all the elements of your arrangement, starting from the top, when I noticed the snake. I love snakes, and this one looks real, so I thought, “did you get a pet snake, and how did you get it to stay in one place? !” So, I was pleased to be able to find my answer in your writing. I love the things you find on your little jaunts. A snake in the fridge! What else you got in there? I recently had a close encounter with his living cousin, up in Sedona. I love snakes. Such fascinating creatures.